On the third day of the BIRN Summer School in Romania, journalists learned about interviewing techniques, how to use the Paradise Papers in investigations, verifying videos and uses of podcasts. 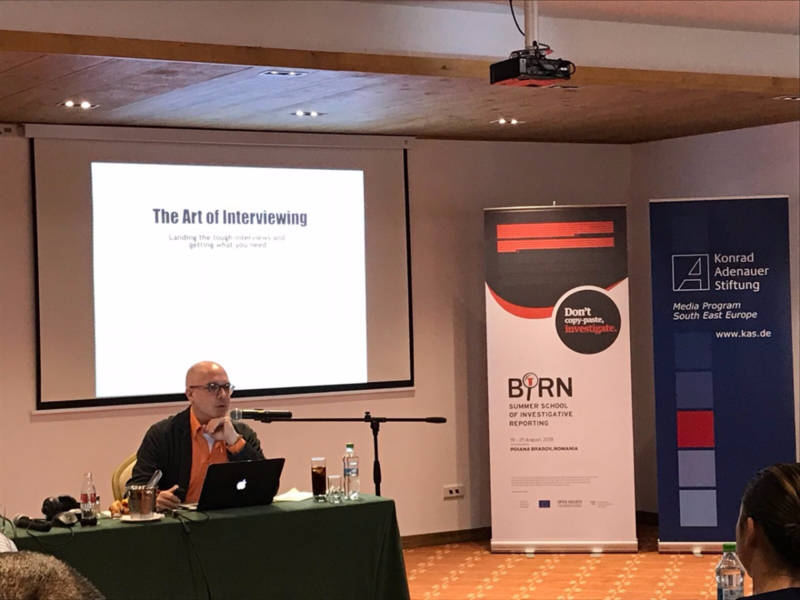 As BIRN’s summer school continued on Wednesday, lead trainer and Reuters investigative projects editor Blake Morrison held a session on the “art of interviewing” and on how to convince difficult sources to talk, describing interviews as a crucial component of the journalistic job. “Think of any story as a blind date,” he told participants. Morrison stressed the need for preparation and gave insight into why some people agree to give an interview – vanity, the need to be understood, self-interest, desperation, guilt and curiosity. Susanne Reber, co-founder of Reveal podcast and Podcasting Executive Producer for E.W. Scripps National, introduced participants to the art of podcasting and of making stories heard. BIRN investigations editor Lawrence Marzouk spoke of how to research the arms trade, using open source data. The financial investigations workshop continued with OCCRP’s Miranda Patrucic explaining the Paradise Papers and how investigative journalists can find leads and data in the leaks. The geolocation and digital investigations workshop also continued on Wednesday, with Bellingcat’s Christiaan Triebert’s lecturing on how to verify if a photo or a video was taken in a certain location at a given time. Lead trainer Morrison held a second practical individual session with journalists. The ninth BIRN Summer School has brought together young journalists from Albania, Bosnia and Herzegovina, Bulgaria, Croatia, Greece, Kosovo, Macedonia, Moldova, Romania, Serbia, Ukraine, the UK, and the United States. For the first time, the Summer School has welcomed journalists from Moldova and Ukraine. The Summer School is organised in cooperation with the Media Program South East Europe of the Konrad Adenauer- Stiftung, Open Society Foundations, the Austrian Development Agency (ADA), the operational unit of Austrian Development Cooperation, with support from the European Union.